Hygge, the Danish concept of cosy conviviality, has been appropriated by the masses over the past couple of years, and has steadily made its way from the pages of glossy fashion magazines to the kind of thing everyone’s mum posts on Pinterest which, incidentally, is where trends go to die. 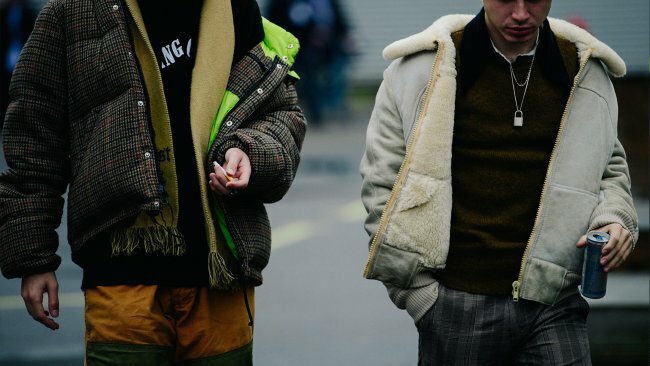 However, the people on the streets of Denmark still need to keep warm, and the gents attending Copenhagen Fashion Week this month showed us that dressing for the Danish winter needn’t be the twee pursuit it’s been painted as. Think less knitwear, lots of natty layering, and a war cry of colour here and there. We don’t have a cute word to neatly define everything that’s going on here, but we think plain old “stylish” will do. Have a gander below. The White House’s disgraced former strategist Mr Steve Bannon made fashion headlines last year for wearing two shirts at once, one layered over the other. This wasn’t decreed a particularly good move (one commentator said it was to stop the ooze leaking out) and, as a rule, layering the same garment over itself is considered verboten. Still, there are exceptions, as this gentleman clearly illustrates. 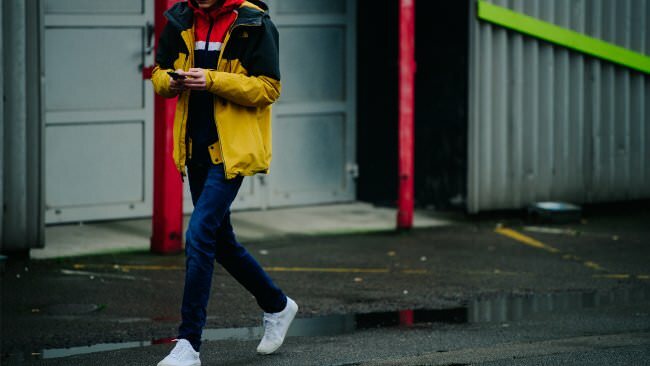 Layering two hooded two-tone jackets together apparently can look rather impressive, and the neutral combo of blue jeans and white sneakers stop it from devolving into something too brash. Top marks for (rather eerily) co-ordinating with the backdrop, too. Tweed isn’t a fabric that finds itself in the realm of streetwear very often, and generally sits on the more formal end of the sartorial spectrum, but it turns out that a quilted jacket in tweed gives an elegant heritage twist to a streetwear staple. Who knew? This guy, apparently. His muted scarf and black hoodie clash rather nicely with the fluorescent lining on the inside of his coat. His companion in the grey shearling jacket and subtly patterened trousers is doing a rather good job with his outfit, too, and has pulled off looking cosy and tough all at once – must be that padlock necklace. 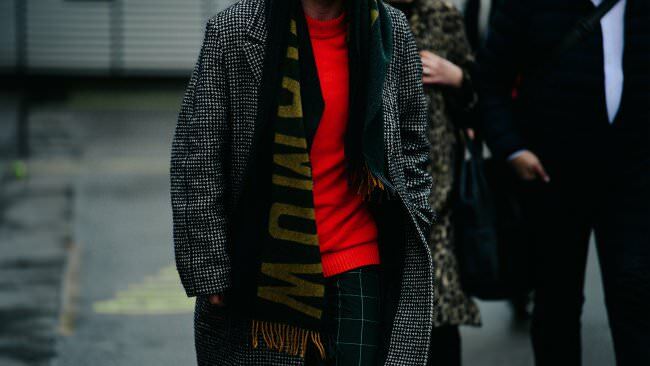 More patterned trousers here, this time paired with a wool coat, Acne Studios scarf and a red sweater that, despite burning a rather violent hue, ties everything together. A colour as bright as this can be a bold choice, but employed as a “pop” of colour (ie, the only thing in your outfit that is vying for a disproportionate amount of attention), it becomes easy to pull off, and letting it blaze out from beneath a woolly coat and scarf is a good way to add some pizzazz to an otherwise softly-softly winter outfit. Layering isn’t always about messing about with bright colours and textures. Great results can be achieved with the simple alchemy of playing around with neutral colours in similar fabrics. This beige collared jacket worn over what looks like a white cotton polo neck is minimal excellence in motion. Another unexpected move is carrying a backpack as if it’s a tote, which, although seemingly counterintuitive, strikes the perfect pitch when adding a hit of streetwear to an otherwise elegant outfit. Speaking of elegance, this article intended to focus on the men rather than the women (you’ll have to head over to Net-A-Porter for that), but it’s impossible not to doff our collective cap to this man’s cocoon-coated companion, resplendent in pink. 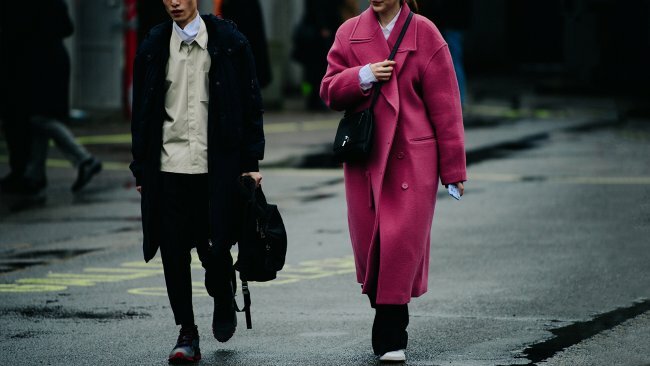 Wearing as many coats as possible really does seem to be the emerging trend of Copenhagen Fashion Week. 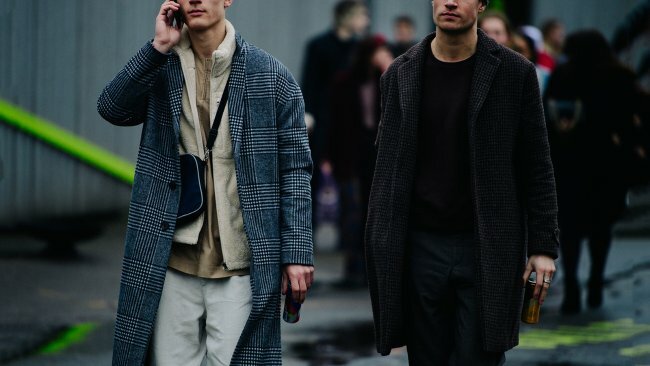 This guy on the left, wearing a checked overcoat over a fleece jacket over what looks like a zip-up shirt (and a very on-trend over-the-shoulder belt bag) looks great, so we’re entirely sold on this whole penchant for millefeuille dressing. 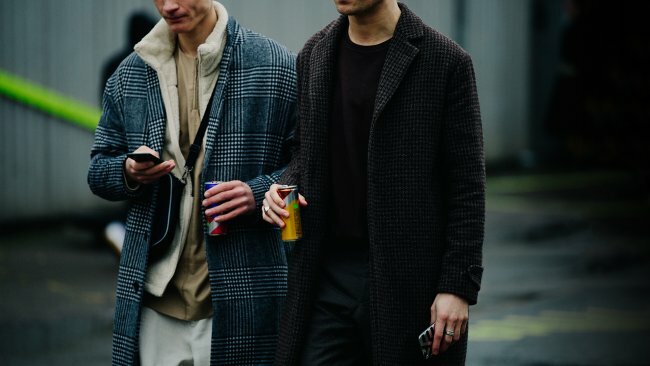 His friend on the right clearly didn’t get the memo, but his black crew neck and dark patterned coat combination still looks incredibly refined, so we’re not too hung up on that. The striped cans are a curious choice of accessory – coffee, Red Bull, or perhaps a special edition of the Copenhagen-based beer Carlsberg? How do you say cheers in Danish?